DownWithTyranny! : Wonder Why Voters Hate Politicians? Wonder Why Voters Hate Politicians? Elizabeth Warren's speech on the Senate floor Wednesday-- connecting GOP establishment meltdown because of a Trumpf/Cruz takeover with the party establishment's own deranged extremism in regard to the Obama presidency-- is worth listening to. The systematic attempt to delegitimize President Obama-- something concocted by "moderates" like Paul Ryan on the night of his inauguration hasn't worked but has led to a degree of gridlock that has made Congress the most despised institution in America. "(E)xtremists might not like it," she reminded them, "but Barack Obama won the Presidency in 2008 by nine million votes. He won re-election in 2012 by five million votes,” she said. “There were no recounts and no hanging chads, no stuffing the ballot box or tampering with voting machines, no intervention by the United States Supreme Court... If you want to stop extremism in your party, you can start by showing the American people that you respect the President of the United State and the Constitution enough to do your job, right here, in the United States Senate." What she didn't remind them was that at this point in his term, George W. Bush's approval rating was 32% and that, according to a Gallup poll released yesterday, President Obama's job approval rating is 50%-- 87% among Democrats, 45% among independents but only 11% among brainwashed Republicans, ill-served by their leaders and by their hate-spewing media. In March 1988, 51% of U.S. adults approved of Ronald Reagan's job performance, almost identical to Obama's current rating. 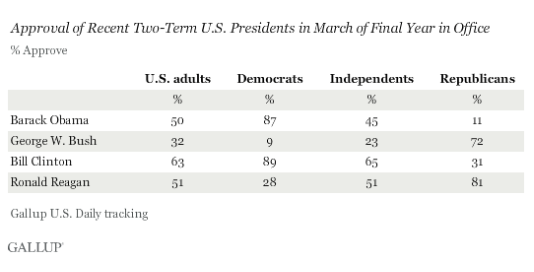 Reagan's profile across party lines was not as polarized as Obama's, however, with 81% approval among Republicans and 28% among Democrats. An unrelated survey, also released yesterday, but by PPP, finds Americans want President Obama to be able to appoint Antonin Scalia’s replacement on the Supreme Court- and they really don’t want any of the Republican front runners for President making the call. Only 33% of voters trust Ted Cruz to nominate the new Supreme Court justice (57% don’t), only 31% trust Donald Trump to (62% don’t), and just 26% trust Marco Rubio to (61% don’t). Independent voters in particular have little faith in the GOP hopefuls to nominate a Supreme Court justice- 61% don’t trust Trump to, and 58% don’t trust either Cruz or Rubio to. One particularly brutal finding for Rubio on this poll is that even among Republicans there are more (45%) who don’t trust him to make that appointment than do (41%) trust him. ...This continues to look like an issue that has the potential to hurt Senate Republicans nationally this year. By a 19 point margin voters say they’re less likely to vote for a Senator who refuses to consider a nominee to the Supreme Court this year, with only 31% saying they’re more likely to vote for someone who takes that stance compared to 50% who say they’re less likely to. Independents would vote against a Senator with that position by a 16 point spread. This issue is just reinforcing the already awful brand of Senate Republicans nationally. Just 10% of voters in the country approve of the job Mitch McConnell is doing, to 59% who disapprove. His unpopularity is a liability for members of his caucus hoping to be reelected this year, and the approach he’s taking on this issue is just making the problem worse. Americans have so little faith in Donald Trump to make a decision of this magnitude that they would prefer a celebrity do it. By a 47/35 spread they would prefer Tom Hanks make the Supreme Court choice, and 45/35 they’d prefer Peyton Manning do it. The news isn’t all bad for Trump on that front though- he does manage to tie Taylor Swift 40/40 on the question of who’s more qualified to put forward a Supreme Court nominee, and he even edges out Mickey Mouse by a narrow 43/39 spread. 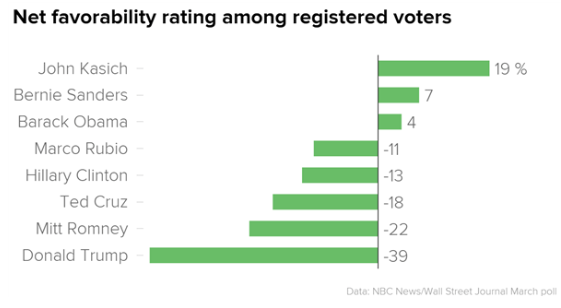 As long as we're on the subject of polls, one by NBC News and the Wall Street Journal indicates that all those debates have made the American people hate all the candidates (except Kasich and Bernie). Trumpf's favorability rating among Americans-- a minus 39-- is the lowest NBC has ever found for a major party candidate in history, 8 points lower than it was last month, which was already the lowest of any major party candidate ever. Rolling around in the muck and slime with Herr Trumpf has destroyed favorability ratings for Rubio, Cruz and Mitt Romney. Just getting near him in any way is positively toxic for anyone who does. Hillary's high negatives aren't attributable to Trumpf-proximity but a hint of why she is so intensely disliked among independents-- and that's why she'd be a disaster for the Democrats if they nominate her-- is examined in an editorial from yesterday's NY Times about her inept performance in Michigan, where a strong and consistent double digit polling lead against Bernie, turned into a loss for her and a win for him. The editors, like most independents, are repulsed by her negative campaign tactics that fail to live up to her rhetoric. That keeps driving down her "trust" numbers. Even Democrats think she's a congenital liar. ...The Clinton machine should stop trying to tie Mr. Sanders to the National Rifle Association. Though Mr. Sanders has a D-minus from the N.R.A., in Michigan Mrs. Clinton’s operatives took to Twitter touting the N.R.A.’s tweets supporting Mr. Sanders’s statement that making manufacturers liable for gun violence would destroy gun manufacturing in America. On Tuesday, her campaign issued a news release saying that the mothers of Trayvon Martin and Jordan Davis, two African-American shooting victims, “are speaking out about Senator Bernie Sanders’ comments on guns and African-Americans in Sunday’s Democratic primary debate.” Mr. Sanders, like Mrs. Clinton, has spent decades working against racial discrimination, poverty and gun violence. To suggest otherwise is wrong. Mrs. Clinton may be annoyed at the continued challenge posed by the self-described democratic socialist from Vermont. “The sooner I could become your nominee, the more I could begin to turn our attention to the Republicans,” she told a crowd in Detroit. But Mr. Sanders is likely to remain in the contest to the end, and if she is the Democratic nominee, Mrs. Clinton must win over and energize his supporters. The results in Michigan suggest she has a ways to go. No one likes a liar and only her devoted followers fail to see that that's exactly what she is, has always been and will always be. She isn't fit for the nomination of the Democratic Party. She'd fit in better with her old party, where lying is de rigueur. The Democratic establishment-- eager for the corruption regime they know her return to the White House would bring-- is counting on the GOP nominating Trumpf and the lesser-of-two-evils scenario kicking if in her favor. It's her only path to victory. Trumpf has a pronounced blundering buffoon side and when he threatens legal action against Clinton, it probably rallies voters around her. It may help with fans of Hate Talk Radio and Fox hosts but normal people are revolted by when Trumpf says he will have her prosecuted. In a single year, in case after case, across many sectors of the economy, federal agencies caught big companies breaking the law-- defrauding taxpayers, covering up deadly safety problems, even precipitating the financial collapse in 2008-- and let them off the hook with barely a slap on the wrist. Often, companies paid meager fines, which some will try to write off as a tax deduction. These enforcement failures demean our principles. They also represent missed opportunities to address some of the nation’s most pressing challenges. Consider just two areas-- college affordability and health care-- where robust enforcement of current law could help millions of people. ...The next president can rebuild faith in our institutions by honoring the simple notion that nobody is above the law, but it will happen only if voters demand it. Herr Trumpf might even sound like he almost had his head screwed on right if he talked about some of these cases, or about Rick Snyder, instead of feeding the sick, right-wing fantasies about Hillary Clinton on a crime spree. 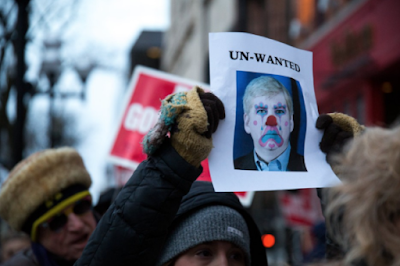 One of the DWT art photos of Governor Snyder made it to a Michigan street protest. Herr Trumpf should pick up on it. That he has the highest net favorability rating among all the candidates is truly scary. Liar, liar pants suit on fire. Obamabots won't like Elizabeth Warren's op-ed, but the blame goes to Barack Obama, whose Wall St lackey Eric Holder was too busy busting medical marijuana dispensaries and persecuting whistleblowers to do his job against his former and current employers. #1 - Popularity polls of current and previous presidents are an exercise in bullsh!t. For some unfathomable reason, Billy Bob Clinton is 'popular' among democrats in spite of his DLC moving the party economically to the right of Richard Nixon. #2 - Gridlock in Congress is a misnomer. Any time the 1/10th of 1%ers have a major want, the corporately owned democrats and corporately owned republicans have no 'gridlock'. It is only on issues that would benefit the poor and working poor that 'gridlock' occurs and it would not do so there without the willing compliance of the corporately owned democrats. Did You Know Herr Trumpf Owns A Modeling Agency? Corrupt DC Democratic Establishment Crumbling?